This is a simple unleavened bread recipe. When making unleavened bread you must be somewhat quick. From the time moisture (ex: water) hits the flour, fermentation will start to take place. You must make the transfer to the oven as quick as possible to slow-down any fermentation within a time-frame of 18 minutes or less. Fermentation occurs when yeast and bacteria inside the dough convert carbohydrates to carbon dioxide causing gas bubbles to form, which has a leavening effect on dough. *Note: Be sure to not use any type of leavening agents such as yeast, baking soda, or baking powder. Preheat oven to 450 degrees Fahrenheit. Line a baking sheet with parchment paper. If you are using the stove-top burner, turn your heat on medium-high or high. Mix flour, oil, and salt together in a bowl; add water and knead a few minutes. Sprinkle a little flour on counter top to prevent sticking. Form dough into 6 balls and press into disks onto the prepared baking sheet using your hands. Take a fork and prick holes in the dough. Bake in the preheated oven until bread is cooked, 8 to 15 minutes. 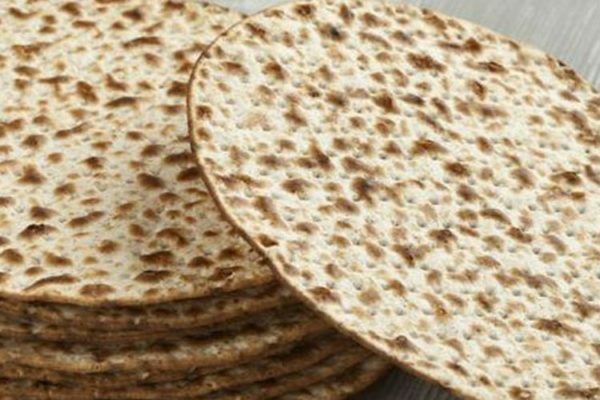 There are three ways to make unleavened bread: on a iron plate/griddle, hot stones or in an oven.